Using a growth chart , plot your child’s height and weight. Ask your doctor for a copy of your infant or child’s growth records from past office visits. If your child is at the 50th percentile or higher in both height and weight, chances are she’s getting enough calories, if not a balanced diet. Significant drops in the percentile ranking on the growth chart suggest there may be a problem with under-nutrition. The percentile where your child now plots is not as informative as the degree of change from the percentiles in previous months. For example, if your child has consistently been around the 50th percentile in weight and then there is a gradual fall to a lower percentile, say the 25th percentile, over several months, take this as a clue that your child may not be getting enough to eat. Under-nourishment shows up first in a slowing of weight gain. Tapering off in height reflects a more severe, prolonged nutritional deficiency. Remember, however, there are two normal reasons why babies’ weight will taper off on the growth chart: First, previously plump babies, when they begin burning more energy by crawling, walking, and running, will often taper off in their weight gain and drop a bit on growth chart percentiles between nine months and two years. Secondly, body type is important. Children with ectomorph body builds (tall and lanky) will normally show a drop in weight percentile while going up in height; they may wind up around the 75th percentile for height and the 25th percentile for weight. While growth charts are not infallible as indicators of optimal growth, they provide clues as to whether or not your child is getting proper nutrition and getting enough to eat. Hair: sparse, brittle, dry, and easily plucked. Note: Most of these signs indicate severe nutritional deficiencies of vitamins and minerals, as well as overall under-nutrition. If a child is only slightly undernourished, you may see only a few or none of these signs. 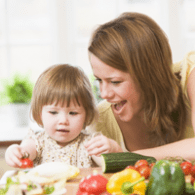 The first two steps will give you an indication of whether your child has a moderate to severe nutritional deficiency, but they do not tell you if your child is getting optimal nutrition for optimal growth. The only way you can be absolutely certain of that is to do a detailed nutritional analysis. Here’s how. Record everything your child eats for a week. Because children have such erratic eating habits, a week-long record is more informative than a daily one. Record the type of food, the brand, and the amount eaten (e.g., ounces, cups, tablespoons, pieces). Next, set up an appointment with a nutritionist who is knowledgeable and equipped to do nutritional analyses. The nutritionist will take your food record and put it through a computer program that analyzes the nutrient content of what the child has eaten and prints out the child’s daily average intake of calories, proteins, carbohydrates, fats, vitamins, minerals, and fiber. The nutritionist then compares these values with the RDA or optimal values for your child’s age. If deficiencies are identified, you and the nutritionist work out a plan to remedy the problems. This would include changes in the child’s diet, and possibly some supplements to make up for any vitamin and mineral deficiencies. As you can see, this is a time-consuming process for you and the nutritionist. (It can be expensive, too, though some health insurance plans may cover the cost.) But in my own pediatric practice where I’ve struggled with finding an accurate way of determining if a child is getting enough to eat, I have found that the nutritional analysis is the only way to get the answers that parents want and the child deserves. Of course, the nutritional analysis is only as accurate as the data you put into it. Be a keen observer and an accurate recorder. If you want to bypass the nutritionist and the computer program, you can do a nutritional analysis on your own (and learn a lot about nutrition in general). Here is the resource you will need: Food Values of Portions Commonly Used by J.A.T. Pennington, Lippincott, New York, 19th edition, 2009. Using this reference and a calculator, you can add up the nutrients in all the foods your child has eaten in a week and compare the daily averages with the RDAs. This will probably take you a couple of days and a lot of paper. Putting this into a nutritional analysis computer program will produce results within a couple hours.